Organizing playdates for dogs is probably one of the best ways to provide your dog enrichment, both in terms of mental stimulation and physical exercise. But how do you find your dog’s perfect play partner, and what can you do to ensure that a dog playdate will be successful? 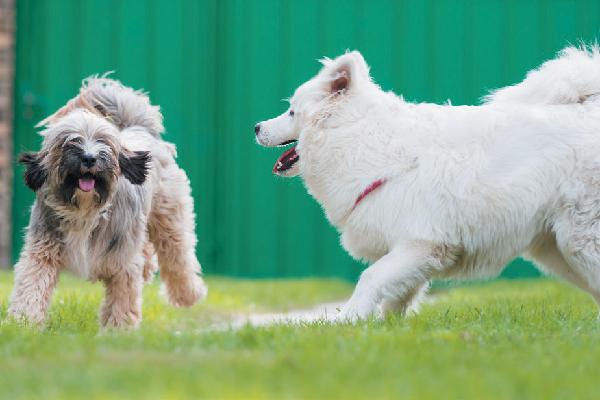 Is your dog ready for a playdate? ©StacySpeckmanPhotography | Getty Images. Before you begin organizing a dog playdate, ask yourself the following questions. How confident is my dog around new people and other dogs? Does my dog like social interaction with other dogs? Does my dog become possessive of her resources when she’s around other dogs? Is my dog comfortable with dog-to-dog play? If you have any doubts about some of the answers to these questions, address those issues first before you bring a dog around to play. If you think your dog is socially confident, and you have found the perfect playmate, begin by walking both dogs outside first before you bring them into the home so they can meet each other on neutral territory. This will help prevent any territorial issues your dog might have and get her comfortable with her new play partner in an environment free from competition. Exploration behavior is more likely to happen in an undiscovered area and gives both dogs sensory distractions that encourage seeking behavior rather than competition. Just the experience of doing things together, like smelling the same patch of grass or peeing on the same tree, will help facilitate social ease and bonding. This can be done on leash to begin with, but if you are in a safe off-leash area, then off-leash interaction is preferable. Allow your dog to make choices on her playdate. Photography ©fotokostic | Getty Images. 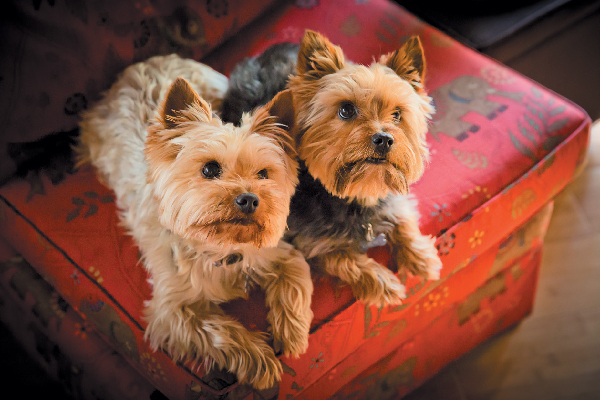 Even if the dogs seem comfortable with each other, remove any objects your dog might guard, such as toys, chews or food bowls, before you bring them into the home. Watch for any signs of tension, such as body stiffness or posturing between the dogs, and praise calm, relaxed and confident interaction. If you can start in the yard where there is more space and then come into the house, this will help your dog relax more and accept the new dog on her territory. Don’t forget that although we want our dogs to be friendly with every dog they meet in and out of the home, this is often unrealistic. We have the freedom to choose who we want to hang out with and who we want to avoid, but our dogs often don’t, and it can be threatening and uncomfortable for some dogs to have their personal space invaded by a stranger. Allow your dog to make choices on who she wants in her personal space, and don’t force her to interact with a dog who makes her uncomfortable. If she makes the choice to stay and interact with her play partner, chances are she’s telling you that all is good. If she backs away and practices avoidance, she might be uncomfortable or just not in the mood for social interaction at that time. Allowing her to make choices and giving her a certain amount of control and autonomy over her decisions will really help take pressure off and increase her confidence in social situations. Watch out for dog body language on a playdate. Photography ©petographer | Alamy Stock Photo. 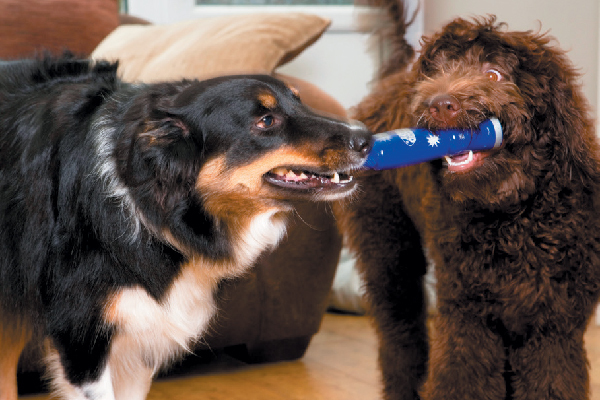 Good dog-to-dog play is a series of active and repetitive behaviors that have different meanings when performed in other contexts, but during play both dogs should understand the rules of the game. Play bows and other body signals that happen during active play provide natural breaks and signal to each dog that what is coming next is still just play. Winning and losing the game, and being sensitive to the other dog’s cut-off signals and need for momentary space during the game is healthy and should be encouraged. If one dog seems uncomfortable because the other dog is playing too rough, separate them and allow a cool-off period before they interact again. You are your dog’s advocate, so be a good observer of body language, and keep an eye out for any language that might indicate your dog is stressed. Sometimes the best-laid plans go bad, and if either dog is uncomfortable, don’t force the issue. Find another playmate. Allowing your dog to play with other dogs in your household and organizing playdates with canine friends will help your dog rehearse valuable play behavior and maintain good social skills. Playdates are a fun, social activity that keep your dog healthy and enriched. Thumbnail: Photography ©Kane Skennar | Getty Images. The post Creating the Perfect Dog Playdate appeared first on Dogster.